Turtle paintings by Aboriginal artists of northern Australia show a favoured food resource & Indigenous totems from Dreamtime stories and law. 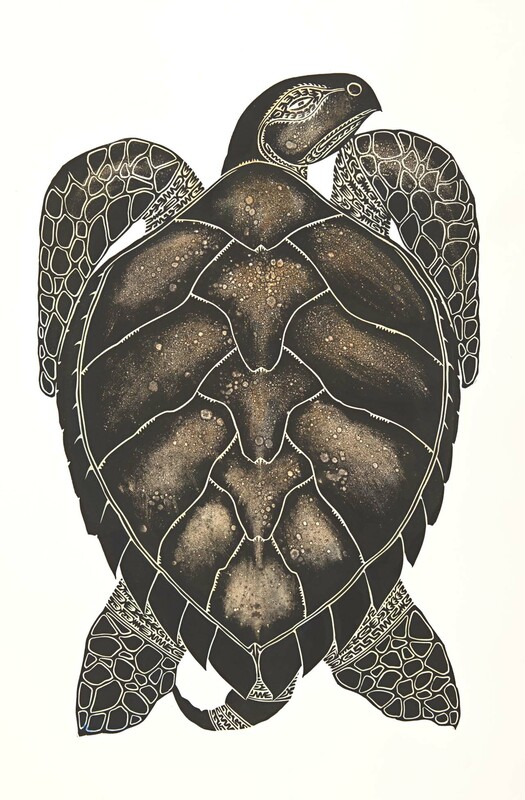 Turtle artworks are common from Aboriginal artists from the northern areas of Australia. Turtles are a favoured food source for Indigenous communities and therefore appear as totems and in Dreamtime stories and Creation myths. Indigenous people respect the food resources that sustain them and they celebrate the turtle in rituals that aim to increase the bounty of the species. Turtles are found in freshwater lakes and billabongs as well as the large saltwater turtles. The main regions where paintings that feature turtles are produced include Maningrida, Ramingining and Ngukurr in Arnhemland, Tiwi Islands and Daly River in Northern Territory, Torres Strait Islands and on Cape York Peninsula in Queensland and Mowanjum and Broome in the Kimberley. When turtles are shown with fine lines or cross-hatching drawn over their shells, this shows the traditional marks used by Arnhemland artists. These marks are called rarrk and are used to indicate totems and family designs that link specific animals to the families through Dreamtime law. Often the hunting of animals is managed and controlled by social laws that reflect the links between families and totems.